The Shaky Football Head features Owner's Twistlock® "Centering Pin Spring" (CPS - US Patent 7,841,127) molded into the lead. The football shaped head is contoured on the bottom to promote a rocking motion in the plane of the hook to achieve "up-and-down" movement. 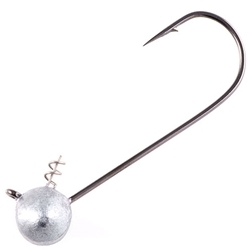 Features include a round bend, light wire hook with a 45° cross-eye, Super Needle Point and black chrome finish.